fresh or dried herbs such as rosemary, thyme, tarragon or sage. Preheat your oven to 220'c. Meanwhile rub your chicken inside and out with half a lemon. Place the lemon and two whole garlics that have been crushed with the back of a knife into the cavity. 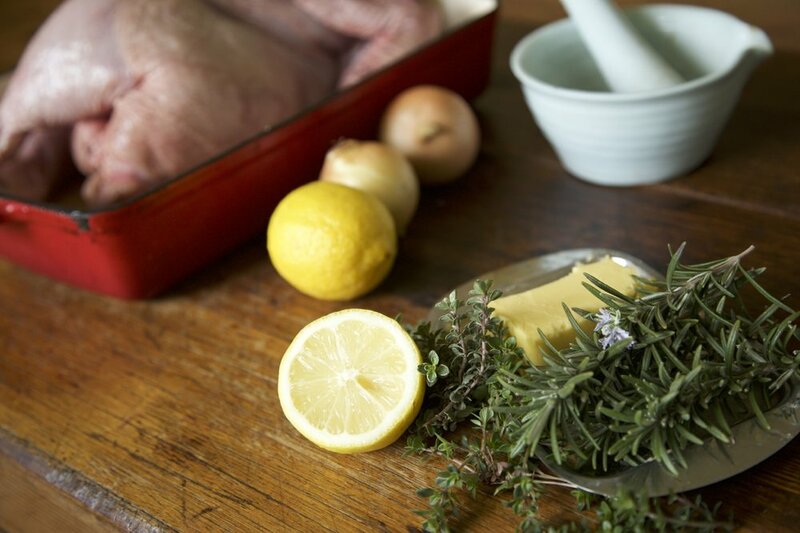 Then rub outside of chicken with a small cube of butter (or a drizzle of olive oil) and a generous teaspoon of sea salt, sprinkling of cracked pepper and chopped dried or fresh herbs of your choosing: we love a mix of fresh rosemary, thyme + sage leaves. If you want to get fancy you can stuff a slither of butter + fresh herbs under the skin of each breast - this will make skin especially delicious and crispy. Next fill a large oven tray with chopped fresh vegetables such as potatoes, sweet potatoes, golden beetroots, carrots, pumpkin, parsnips and onions. Drizzle vegetables with a little olive oil and season with salt, pepper and fresh herbs. Place chicken on top of the vegetables, on one side. Roast for 1/2 hour at 220c. Turn chicken over to the other side and roast for another 1/2 hour. Lower oven temp to 180'c and turn chicken over completely, roast for a further 1/2-45 mins. 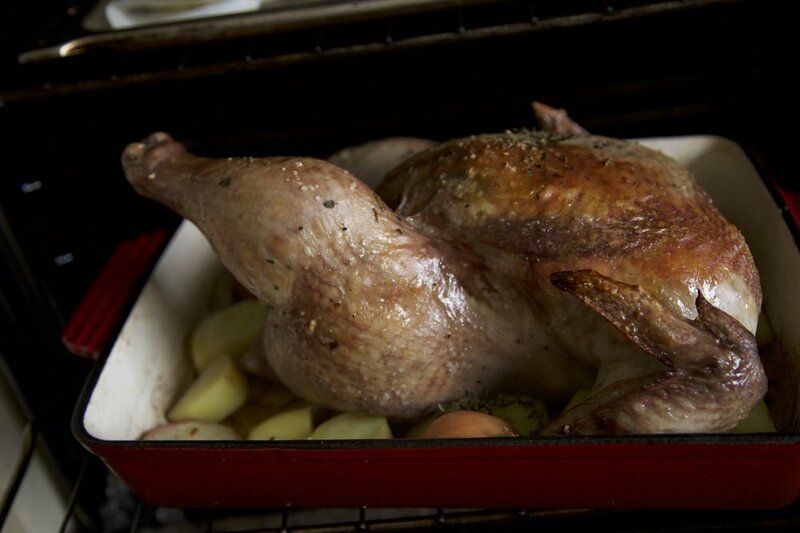 Test chicken is cooked thoroughly by piecing leg meat with a knife - if the juice runs clear it is cooked. Remove chicken from oven and let rest for 10 minutes before carving up. Remove roast vegetables and reserve delicious chicken juices for serving in a jug or reduce with some white wine + a spoon of sour cream to make a scrumptious creamy gravy. 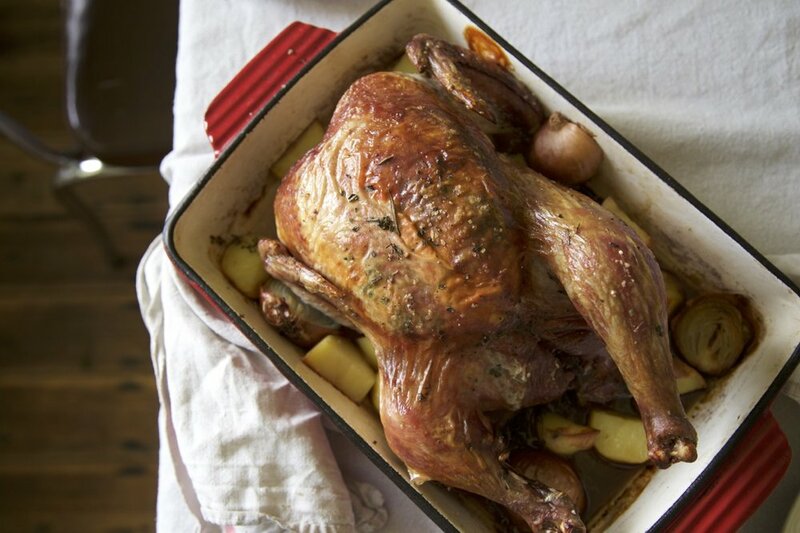 Leftover roast chicken can be stored in the fridge and used for soups, stews, salads and sandwiches! The chicken carcass can then be used along with fresh vegetable scraps to make a delicious and wholesome broth. Place the chicken carcass (lemon removed), along with a chopped onion, carrot and celery stalk, you can also add in vegetable peelings, parsley stalks and other herbs plus a teaspoon of cider vinegar, a few whole peppercorns and 1 teaspoon salt. Fill with enough water to cover the carcass (about 2 litres). Let the broth come to a simmer then lower heat for a gentle simmer so the liquid reduces by half - it will take a couple of hours. Alternatively you can use a crock pot or slow-cooker to make an overnight broth following it's instructions. My recipe for the best ever gluten free buckwheat pancakes! It is now March, and the garden is still persevering... Hurray! Today is our firstborn Reuben's fourth birthday.